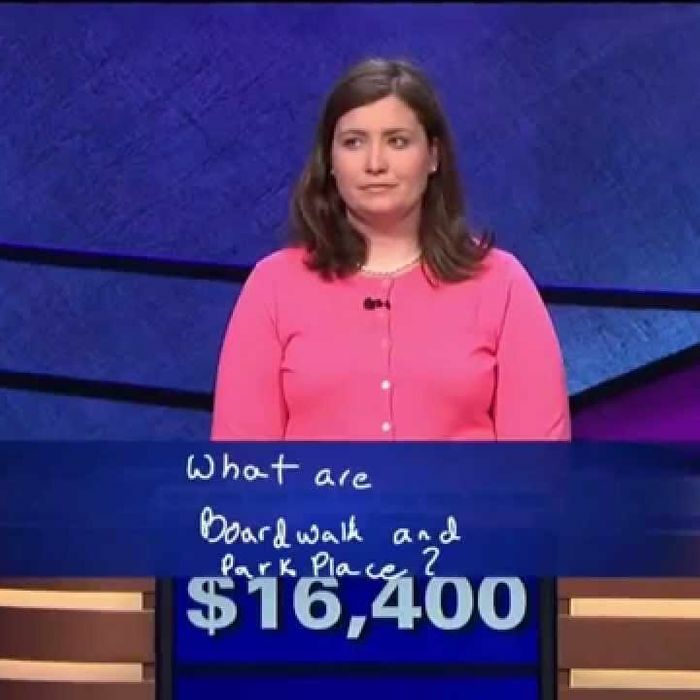 On April 8, an environmental compliance manager from Baltimore named Derrick Shivar hauled in $22,800 on Jeopardy! His triumph would be otherwise unremarkable in the annals of the storied game show except for this: That was was the last time a man won a match on the show. Since then, women have been on an unprecedented run on a program that has long been a target for complaints from feminists and other critics wondering why, for three decades now, the vast majority of players and winners have been male. The current champ, Julia Collins from Wilmette, Illinois, rolls cheerfully into Thursday’s show on a 18-game winning streak, during which she has amassed $391,600. She long ago surpassed the prior top female money winner, Larissa Kelly, and now she’s won more games in a row than all but two players in the game’s history. Tonight, the 31-year-old Wellesley alum with a master’s from MIT guns to tie the 19-game streak enjoyed by Dave Madden when he took home $430,400 in 2005. Then she can consider setting her sights on the 74-game record set in 2004 by the legendary Ken Jennings. Yet while Collins’s success is obviously an aberration for any contestant, she’s also now the most visible evidence that women have finally begun making their marks on the program. Of the 73 non-tournament matches that have aired so far in 2014, female players have won 45. Aside from Collins’s monster run, two others, Sandie Baker and Sarah McNitt, have enjoyed long streaks, too. But on the male side of that ledger was Arthur Chu, who attained some notoriety for an aggressive playing style and rumpled clothing, and whose 11-game winning streak accounts for nearly half of this year’s male wins. What’s more, of the 63 people who have won more than $100,000 in the 30-year run of the show, only ten are women — and four of them did it either this season or last. The fate of women on Jeopardy! isn’t a frivolous matter, fans of the show insist. Pundits may become absorbed by the hullabaloo surrounding how New York Times editor Jill Abramson was fired or how General Motors CEO Mary Barra was treated by a Congressional subcommittee, but Jeopardy! is the singular place in pop culture where intellectual achievement — especially by women, minorities, even older people — is glamorized. A Vulture analysis of the data chronicled on J! Archive found that, this year to date, female contestants have outnumbered male contestants 78 to 64 in regular match play. That’s 55 percent, a sharp turnaround from the game’s 30-year average, calculated in a much-cited Slate piece, of women comprising 40 percent of Jeopardy! contestants. In fact, eight times — including thrice during Collins’s ongoing reign — all three players were women. With the exception of play during the various tournaments, most notably, the finale of the recent “Battle of the Decades” extravaganza that saw Brad Rutter besting Jennings and Roger Craig to earn $1 million, there have been no all-male matches in 2014. Another theory, muttered mostly in musty corners of the internet, suggests a surge in “female-friendly” material featured in the show. Collins tells Vulture she’s heard that one and was taken aback by backlash on social media during the “Battle of the Decades” tournament — which she didn’t play in — because there were categories about Broadway costume designers and Oscar-winning songs. Those are considered, in some Jeopardy! fan circles, less serious topics, she said. Jass, who teaches women’s studies at Adrian College in Adrian, Michigan, said the show’s writing staff, dominated by men, also allow an “androcentric” perspective to seep into the show material. “You never see a category called ‘Male Artists,’ but you do see ‘Female Artists’ or just ‘Artists,’ which may have some women as answers,” she said. Another place where there seems to be a differential: the Jeopardy! publicity machine. Chu’s 11-game streak earlier this year became a big news story that drew a broad range of attention, including a blog post on the The New Yorker website and an appearance on Fox and Friends after just four wins. By contrast, Collins’ 18-game-and-counting streak is only now beginning to draw some notice and, thus far, only local TV interest. Some of that is due to circumstance — Chu displayed a brash persona and an unkempt appearance that irked some of the more genteel fans of a game seen more as a white-collar affair than a blue-collar street fight. She, like Jass, is doing her best to hone a public persona, in her case by live-tweeting her matches under the handle @JeopardyJulia. After win No. 16, Jennings tweeted his compliments and she replied that she was now in even more awe of his epic streak. “If you’re a white male they give you the answers,” Jennings quipped. “When you’re a woman they tell the other contestants not to try,” she volleyed back.